Bible teachers often use Hebrews 9 as proof that the disciples of Yeshua abandoned the Old Testament rituals of Temple worship and sacrifices as vestiges of an old covenant that had been replaced by a new covenant. A closer look reveals an entirely different message. 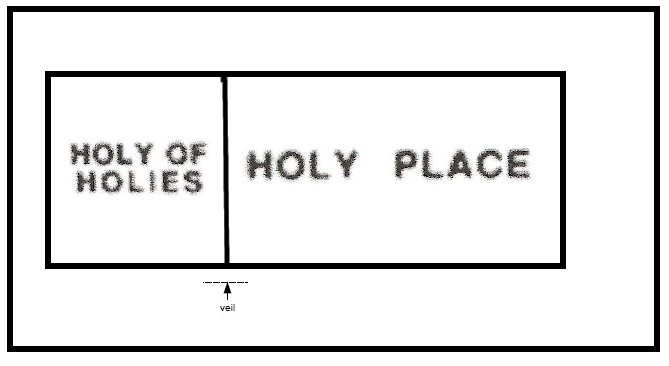 Hebrews 9 uses the layout of the Temple to present a mystical illustration of the passage from this world to the world to come. Lancaster finished his survey of the New Covenant as it applies to Hebrews 8 in the previous week’s sermon which I reviewed here. This also should have finished Hebrews 8 and have taken us into chapter 9 but there’s something Lancaster wanted his listeners to get first. Protos and Deuteros. The first or in Greek “Protos” covenant was the Sinai or Mosaic covenant and the second or “Deuteros” covenant is the New Covenant (Jeremiah 31, Ezekiel 36). There needed to be a Deuteros covenant because God found fault with “them” not “it”. That is, He found fault with people not the Protos covenant and not the conditions of the Protos covenant, the Torah, and not with the enactment of some of the covenant commandments which involve the Temple and the Priesthood (all this is covered in previous reviews and you can listen to the recording of this sermon to pick up more details). Verb tenses are really important here which is why some English translations of the Bible, including the English Standard Version (ESV) are bad, because they make everything sound like it’s in the past tense, which is not what the actual Greek says. Remember, interpretation begins at translation. Some translators read their theology back into the text when they do the translation, changing the literal meaning to fit their assumptions and all of the classic, though erroneous, perspectives they’ve been taught as part of Christian tradition. The reason Protos and Deuteros are important is because Paul makes a lot of symbolic use of these two terms as we enter chapter 9. What is becoming obsolete and getting ready (but hasn’t yet) to disappear? 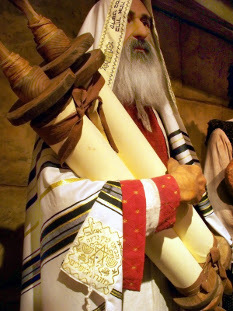 Not the Torah, because it represents the conditions of both the Sinai and the New Covenants. Not the Temple because the Temple was still standing when this epistle was written and there will be a Temple in the Messianic Age. Not the Priesthood because God declared that the Aaronic Priesthood is eternal. So what does Protos represent that is in the process of becoming obsolete and getting ready to disappear. The Olam Hazah or the Present Age. The age that we have with us now. The age of everything before the Messianic Age and the Age to Come. That’s what is just about to, but hasn’t yet because we’re still in it, get ready to pass away. Now this next part has to be followed carefully. Once you get it, it’s rather simple to comprehend, but it’s easy to get lost if you don’t get it. Lancaster admitted that he makes it all sound more complicated than it really is. Now even the first covenant had regulations of divine worship and the earthly sanctuary. For there was a tabernacle prepared, the outer one, in which were the lampstand and the table and the sacred bread; this is called the holy place. Behind the second veil there was a tabernacle which is called the Holy of Holies, having a golden altar of incense and the ark of the covenant covered on all sides with gold, in which was a golden jar holding the manna, and Aaron’s rod which budded, and the tables of the covenant; and above it were the cherubim of glory overshadowing the mercy seat; but of these things we cannot now speak in detail. Both Lancaster and the writer of the Hebrews epistle are hip deep in symbolism at this point. The Holy Place described in these verses is the Protos or the Present Age. The Holy of Holies is the Deuteros or the Age to Come. Lancaster goes into a lengthy and detailed explanation of what each of the objects in this analogy of the letter writer’s description means but basically, the Present Age is where all of the daily duties of the Priests occur. It’s where we live today. Here’s what I mean. Remember, Lancaster says that he believes the Temple was still standing when this letter was written, so he’s being quite literal. But also, this is representative of the fact that he was describing the Present Age, the age in which he and his readers were living and the age in which we continue to live. We have daily access to the holy things and the service to God as described in the Sinai Covenant (and remember, this is a Jewish person writing to Jewish people so for them, it’s all about the Sinai Covenant). It doesn’t matter that the Temple is now destroyed because Solomon’s Temple was destroyed and there was a long period between that and the building of Herod’s Temple, and yet the Sinai Covenant was (and is) still in effect. 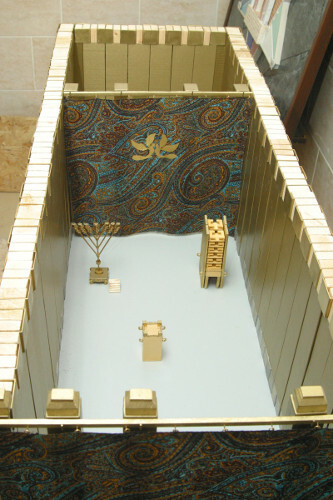 The Holy of Holies by contrast, represents the Age to Come which begins or which is beginning in the Messianic Age, the place where not just any Priest but only the High Priest could enter, and not on a daily basis but only on one day of the year, Yom Kippur, the Day of Atonement, and the High Priest could only enter carrying blood. He’s saying that the Holy Place, representing our reality today, still has Godliness but there’s a big difference between what we have now and what is going to happen. Now when these things have been so prepared, the priests are continually entering the outer tabernacle performing the divine worship, but into the second, only the high priest enters once a year, not without taking blood, which he offers for himself and for the sins of the people committed in ignorance. The Holy Spirit is signifying this, that the way into the holy place has not yet been disclosed while the outer tabernacle is still standing, which is a symbol for the present time. Accordingly both gifts and sacrifices are offered which cannot make the worshiper perfect in conscience, since they relate only to food and drink and various washings, regulations for the body imposed until a time of reformation. The Holy Spirit is signifying this, that the way into the holy place has not yet been disclosed while the outer tabernacle is still standing, which is a symbol for the present time. The way into the New Covenant age has not been shown to us nor will it be while the current age exists, the Present Age, the age we are living in right now. So the Old (Sinai) Covenant still is in effect and we are still living in the Present Age under the rules and conditions of the Old Covenant. Nothing has been replaced, including the Sinai Covenant, the Torah, the Temple (since it will be rebuilt) and the Priesthood (since it’s an eternal Priesthood and will make sacrifices in the Temple in the Messianic Age). But why isn’t the New Covenant Age open to us yet? Most Christians take these verses to mean that once Yeshua (Jesus) died, the Priesthood was abolished and everyone could enter the (spiritual) Holy of Holies and stand before the throne of God. And yet the writer of the epistle to the Hebrews is saying that this isn’t true and it won’t be true until the New Covenant Age which Messiah will bring to completion, or near completion, when he returns. I was following Lancaster along pretty well but this next part was new to me. The Present Age is represented by the Holy Place, where our daily service to God takes place and where the Sinai Covenant remains in effect. The Present Age is slowly beginning to pass away and about to become obsolete, but since it’s still here and we’re still here, it still has some life left in it. 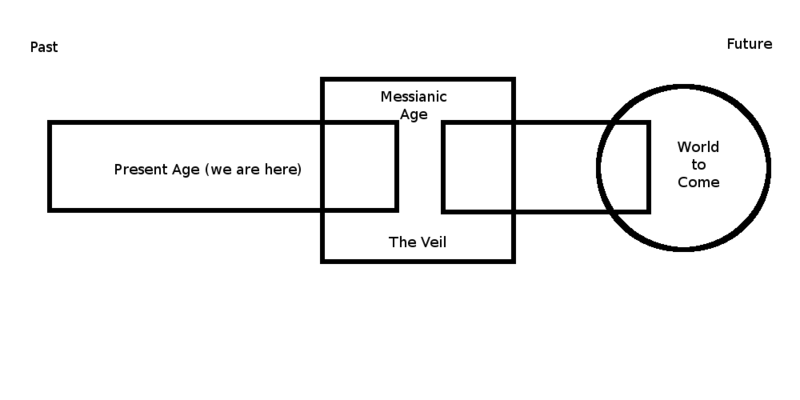 The Messianic Age can be compared to the veil between the Holy Place and the Holy of Holies. Both resurrected/perfected people, the Saints, so to speak, in Christ who will rise at the first resurrection and the rest of the people alive at his Second Coming who are yet to be resurrected. It’s the intersection between covenants which is why there will have to be a Temple. It is only at this point in future history, after the Messianic Age has passed away, that the Sinai Covenant will also pass away and there will no longer be a need for the Temple. It’s difficult to imagine what life will be like here, but this is part of what’s being described. But it’s not as relevant as what happens in the Messianic Age and indeed what’s happening now. But when Christ appeared as a high priest of the good things to come, He entered through the greater and more perfect tabernacle, not made with hands, that is to say, not of this creation; and not through the blood of goats and calves, but through His own blood, He entered the holy place once for all, [m]having obtained eternal redemption. Even though we can’t actually enter the Deuteros, the second, the New Covenant Age yet, we still have a stake in it that allows us to live as if we have already entered. How can we do this? Because we have a High Priest who has entered before us, the first fruits of the dead (1 Corinthians 15:20). How can he enter where we cannot? Because he already died and was resurrected into a perfected body. We haven’t done that yet. Also, since even the High Priest cannot enter without blood, the blood he shed in the Present Age he “carried” (spiritually, not literally with his hands) from the Protos to the Deuteros as a one time event (not an annual event as is the present Yom Kippur) as a forerunner for the rest of us, and to provide an anchor for us, bridging the gap from the Present Age to the Age to Come. As I was listening to Lancaster, I realized that when the Temple veil was torn top to bottom the moment Jesus died, it wasn’t a sign that the Old Covenant was dead and buried right then and there so we all could immediately enter the Holy of Holies and stand naked before the Throne of God. It was a sign that the High Priest of Heaven, Messiah Yeshua could now enter…but only him, and only in the Heavenly Holy of Holies, and only with the blood, his blood. The sermon ended abruptly at this point so I can only imagine Lancaster will continue to follow through next time. Only eleven sermons left to complete the series. It’s getting pretty exciting. I can’t wait to see what comes next. A Google search on “Ama Traksin” isn’t particularly revealing, Alfredo. What are you saying? you will find “LECTURE 95: THE RELATIONSHIP BETWEEN THE HOLY AND THE HOLY OF HOLIESS”. That is very interesting, because it is Jewish thought (not Messianic Jewish I mean) about a place that describes exactly what the Messianic Age represents according to the explanation that Lancaster offers. By the way, when you say “It’s getting pretty exciting. I can’t wait to see what comes next.” I fully agree with you. I think that Lancaster did a great job with this explanation… I think you should also listen to his teaching entitled “New Jerusalem and the Three Camps” and make a blog post on that one too. If you do, I encourage you to read the source (Irenaeus of Lyons, Against Heresies, Book V, Chapter 36) that Lancaster uses on that teaching. That’s great stuff!!! @Alfredo: Thanks for the illumination. @Marleen: Not sure what you mean. The present age is here and now. How is Jerusalem (or anywhere else in the world) not part of the present age? Part of or very much like is not equal to same as. So, like, if you have a segment from point five to one point seven on a line or Ray or longer segment or you have a segment parallel to a long line, you are not looking at the same thing. And Jerusalem in the days of Paul is not Jerusalem forever or Torah or Judaism now. Maybe some wording for a Venn diagram or Boolean operation would be more apt. There are similar or crossing things involved. But we end up with the common idea that Jerusalem was in slavery or children of the slave woman because they cared about Torah. And it would follow that we can’t get out of the present age until Torah is let go. You might keep in mind, Marleen, that the mathematics of metaphor are not so straightforward. I think I shall elucidate (for, as James, our site overseer, has mentioned elsewhere in comments, probably many who don’t post do read). Sometimes, words can sound very different to someone than to someone else. So when I indicated that the common notion about Torah and Jerusalem (in Paul’s Galatians picture) is wrong or mistaken (not Paul but the usual interpretation), I meant that the people in Jerusalem or to be represented by Jerusalem who did (at the time of Paul) care about Torah (those who really and sustainably did care) were enslaved not by Torah but by the condition of Jerusalem — a place that was not properly applying Torah and was subject to Rome and that whole system (as one outpost of the Empire of Caesar). Thus, in a sense it is the case Jerusalem (who was to care about Torah) was in slavery because of Torah (as the city could not therefore wholly embrace the foreign ethos of power and mythology present), or the people were in said slavery — but NOT because it was wrong or passe to care about Torah. To be a slave is not an ideal state, but it is better than being the idolatrous overlords. Yet, if freedom can be obtained, freedom is best (again, not by becoming the slave driver nor abandoning your soul for the pantheon even if to imagine gaining the whole world). Poor guy. I don’t listen every time. I’ve listened a few times, since I started reading here at morningmeditations, to get more a sense of Lancaster’s talks (largely early on to compare to previous experience and see where on the “map” of the world of Bible teachers the thought process is). This is the first time he’s sounded frustrated, and very frustrated was he. It was hard to listen to this instalment. Whew. Just now did. It was quite different from when I commented on his presentations (rather than your/James’ content write up) previously. It doesn’t change where he is on the map, though. Seems like a fellow traveler… now not only in content (mostly) but weariness.